Over the five weeks of the program, pro-life students learn from the foremost leaders in the pro-life movement on a variety of topics, including abortion, euthanasia, stem cell research, Planned Parenthood, legislative strategy, lobbying, politics, communication, grassroots organizing, social media and more. NRLC Academy graduates are currently filling the positions in states across the country as legislative directors, Political Action Committee directors, education directors, and an executive director of one of our state affiliates. Our students have also become sought-after speakers and organizers. Even those who didn’t continue in working within the pro-life movement attest that the NRLC Academy instilled them a sense of duty to always defend life in their day-to-day lives. This year marks the 13th year of the NRLC Academy, and we have seen more than seventy bright, young, energetic and committed pro-life students graduate. We being on July 5th, 2019 in Charleston, South Carolina, where the students will be fully engaged in the 49th annual National Right to Life Convention. From there, students will be transported to NRLC’s national headquarters in Downtown Washington, DC. Students interested in participating in the 2019 summer program, should email the Program Director, Rai Rojas at academy@nrlc.org or call 202-626-8809. More information as well as applications are also available at www.nrlc.org/academy. Tuition for the program is $3600 and includes the cost of the program itself, housing in downtown Washington, DC, and registration/lodging at the National Right to Life Convention in Charleston, SC. 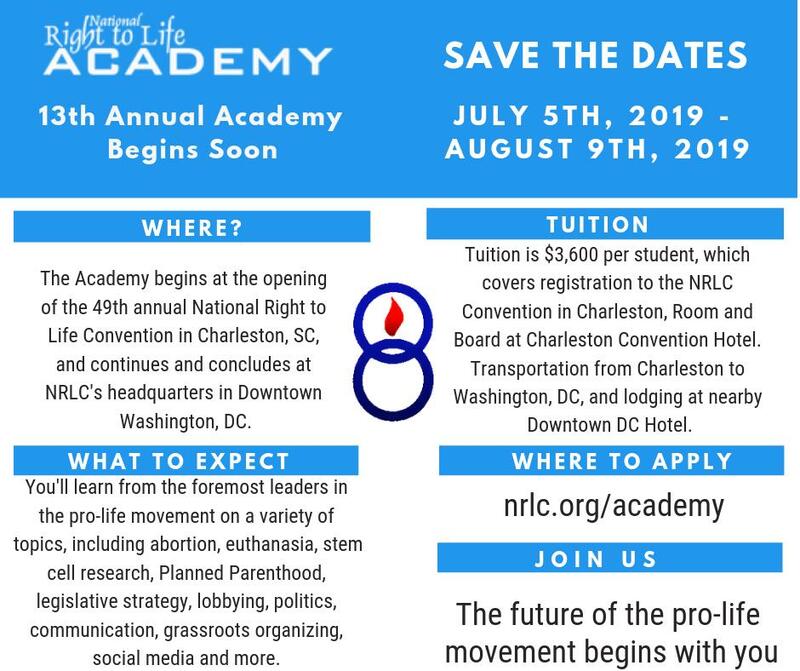 The National Right to Life Academy focuses on equipping young pro-life leaders with the skills and knowledge they need to put their pro-life passion to work. The efforts of just one person can make an incredible difference. And with an estimated 61 million lives lost to abortion since 1973, and the onslaught of pro-euthanasia initiatives, now is the time for each one of us to stand up and be a voice for the most vulnerable. Don’t let this opportunity for the college-aged student in your life pass by. If you know of a student who would benefit from the NRLC Academy, please speak to them and guide them to our website for an application.